Unifuse announces the introduction of two new products to its offerings. The new products are a 25-inch diameter wire -shipping drum with a positioning lid and an upgrade of the 1-1/2 cubic yard bulk tub (BT-40) now made available with a fork collar base. Both new products are manufactured under the Unifuse brand by the proprietary and patented Unifuse VIM process. The ability of Unifuse LLC to create products of superior durability while meeting the needs of special applications continues with these nestable wire shipping/payout drums. 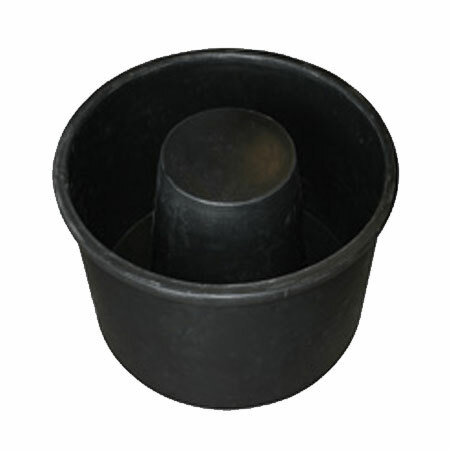 The inside cone design ensures vertical stacking strength and allows easy wrapping and payout of wire and the design of the lid positions each drum perfectly ensuring stability and support. The nestable feature now offers a returnable container where previously there was none. This wire drum was created to replace the disposable fiber drums currently used that are not nestable and are usually not reused. Designed to fit most wire packing and handling environments these products can be easily modified to fit special applications too. The Unifuse process makes this LLDPE product with thick walls for durability and a long service life, which in turn reduces replacement needs and downtime. This new drum product is designed to replace the disposable fiber drums currently being used for wire transport, distribution, and payout. 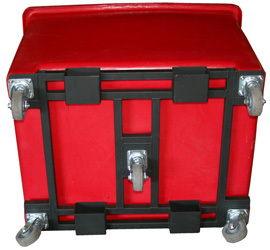 This drum is 25-inches diameter by 15-inches high, which fits 2 by 2 on a standard 48×48 pallet, nests 2:1, and has a weight capacity by flange support of 200-lbs. Shown here nested and with the positioning lid it is easy to see the benefit of using the Unifuse Wire shipping and payout drums. Building onto the already successful line of SERIES BT – Bulk Tub products is the newly designed BT-40, which now features a fork collar base for lifters and dumpers. This customized option meets the needs of many industries and applications by making available a size and design that was recently unavailable in the marketplace. The new BT-40 will continue to serve industries from textile manufacturing and industrial laundry facilities to distribution centers and packing operations. With a top capacity of 2000 lbs. this product provides long-life use ensuring a cost benefit that is currently unmatched. The BT-40 can now be outfitted with a fork collar base. Offering a capacity of 1-1/2 cubic yards (40 cubic feet) and 2000 lbs. this new product will fill a need that has until now has been lacking a solution. Once again Unifuse provides a custom solution for a special application. Unifuse products are made from USDA and FDA compliant low-density polyethylene, which has superb impact and crack resistance even in freezing temperatures. Unifuse plastic products will not rust, chip, or splinter. The Unifuse – VIM process converts thermoplastic pellets or powder to finished parts by vibrational fusing and without fully melting the plastic resins. Through a combination of heat and vibration Unifuse can make large plastic shapes with superior strength and integrity. The special process of Unifuse produces parts without having to subject the plastic resins to thermal degradation. This removes the weakening stresses that are inherent in other plastic production processes thus creating a stronger and more durable Unifuse plastic product.